The new firmware of the HP Prime (Firmware 13333), we now can create a blank app. This blog post will provide a short overview on how the creation process works. 1. Press the [Apps] key. 2. In the Application Library screen, select the soft (Save) key (furthest to the left). 3. On the Base App dropdown box, select None. Its icon is gold with a person in front of a clipboard. 4. Name your app and press (OK). Your newly created app will be added to the end of the applications in the Application Library. 1. Select the new app by pressing the [Apps] key and selecting it. 2. Press [Shift], [ 1 ] (Program). The programs attached to the app is always at the top of the program, regardless whether the other programs are sorted chronologically and alphabetically. 3. Select the app’s program by pressing [ ↑ ]. 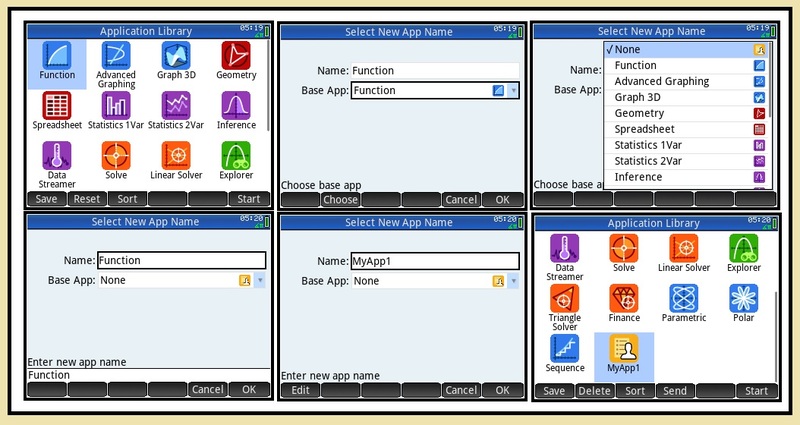 The app’s program is a collection of programs, which are connected to the keys [Symb], [ Plot ], [ Num ], and [ View ]. Thankfully, the new app program is provided with a template, which you can uncomment (by removing the double forward slashes \\ on each line). The following program structures are included, each within their own BEGIN-END structure. VIEW “title”, program() – Each of these are the options presented by pressing the [Views] key. You can have more than one VIEW structure. 1. This is a clean app. Everything must be programmed and all variables must be created. Global and local rules still apply. That means there is no default plot apps Xmin, Xmax, Ymin, Ymax, Xtick, Ytick, etc. We must completely program all of the graph screen should plotting be involved. 2. The following app variables are included. Each value of setting determines the mode. Unless noted, the value of 0 uses the same setting as home. AFiles deals with any additional files attached with the app, with AFilesB being the binary version. Use the DelAFiles to delete associated files. Storing a string to ANote can this information as the Info text. AProgram and AVars deals with specific programs and variables associated with the app. DelAVars deletes such variables. 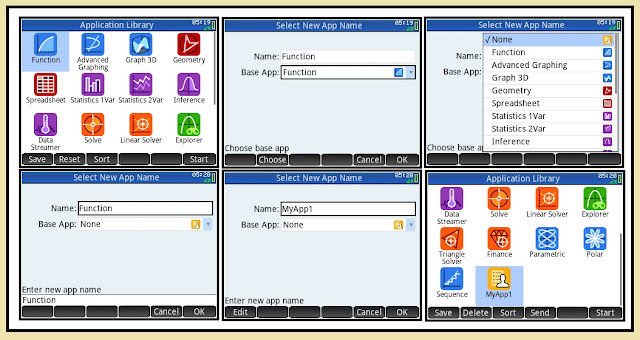 In upcoming blog entries, I will post example custom apps with the HP Prime that can be used and followed for examples. They will be basic in nature. Over 800 posts, close to 7 years (blog celebrates its 7th anniversary on April 11), 94 followers: readers, I am super thankful for your support!